New Yorkers, grab a box of tissues: The New York Post has revealed Solange Knowles is leaving Brooklyn to move to New Orleans. Following a then-mysterious cancellation of her European tour, Knowles said, "I am completely devastated, but between moving part-time to a new city, starting my son in a new school, and writing/recording my new record, I had to make the best decision for my health and provide some stability for my family." 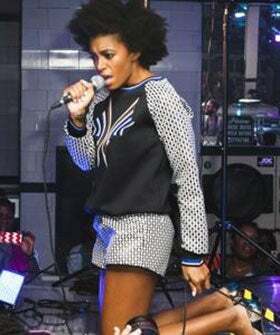 To say her goodbyes to Brooklyn, Knowles made a surprise performance on Monday night at a Boerum Hill laundromat as part of the Vitaminwater and Fader Uncapped Music Series — the same program that's hosted other pop-up shows by the likes of Frank Ocean, Bon Iver, Kendrick Lamar, and Santigold. We just have to wonder: Why New Orleans? A source reports, "She made a final appearance in her home borough for fans and residents before making the move with her 8-year-old son, Julez. She loves the simplicity, warmth, and most important, the space she can get in the Big Easy." The source also reports that Knowles had difficulty during recording sessions in her apartment in Brooklyn, as neighbors would call local police over the noise.